Portrait of an unidentified Florida dragonfly. Dragonflies make great subjects; they are fierce, symmetrical, predacious aviators. And those eyes, of course. Relative to their bodies, the eyes are humongous and consist of thousands of “lenses” (known as ommatidia); they give the dragonflies close to 360˚ vision, quite the advantage for hunting prey and dodging assailants. When the light hits them just right, those eyes give the dragonfly something else very important: beauty. Important to the dragonfly? Maybe not, but to a photographer, and myself in particular, definitely. 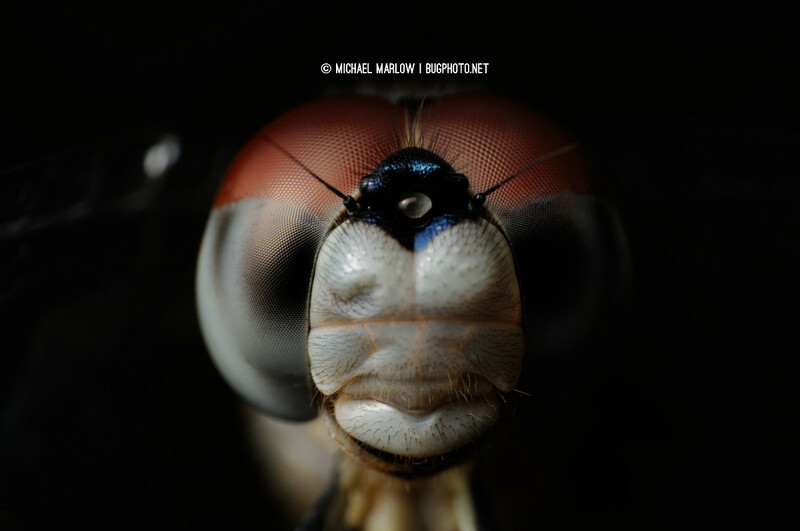 The head-on portrait, as in the featured photo, is one of my favorite shots to get for dragonflies. Naturally, the eyes command the viewer’s attention, but the perspective gives them a disarming, if also a little cartoonish, look. And there’s something about big eyes that bridges the alien divides between humans and their many-legged, fellow terrestrials; it’s what makes a jumping spider seem “cute” to a lot of people, even those who don’t particularly like spiders. 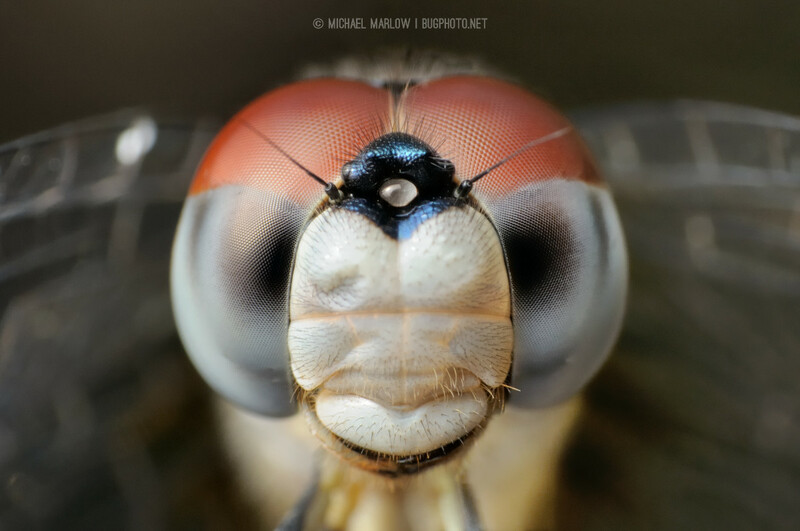 Capturing a dragonfly’s eyes in great detail is always a thrill, but it’s not always easy. First and foremost, it’s hard to get close enough to a dragonfly so that it’s whole head fills up the frame. If I can manage that, the usual difficulties of getting good focus with a jumpy subject come into play. (An aside on focus: the head on dragonfly “face” shot is a prime candidate for a short focus stack; the snout will often come out blurry or lacking sharpness on its whiskers at the expense of focusing on the eyes in a single exposure, as with my shot here.) The topper is trying to handle the specular highlights; those ommatidia are pretty shiny when they get splashed with a burst from a camera flash. Even worse, from a photographer’s point of view, if there is any direct sunlight shining on the dragonfly’s head, it is likely to cause diffraction in your photos, often in a nice hexagonal outline depending on your lens’ aperture blades. The “before” image: this is more or less the original version straight out of the camera (SOOC), before edits, including cropping. The whole series I took was underexposed; I noticed it on the back of the camera as I checked the LCD for my results as I went along, my frustration growing as the usual settings produced unusual effects, but it dawned on me much too late that I had a simple case of dying batteries. By that time, I had moved on and my back up set of batteries, sitting snugly in my bag, hanging on my shoulder, were no doubt shaking their positive nodes in disappointment. Opportunity lost? Not exactly, the images were not great, but not so enveloped in shadows that I couldn’t work with them. Now I had to turn to photo-editing software. I use free software to edit my photos: the NEF (RAW) files are processed in Nikon’s Capture NX-D application and then I usually convert to TIF files and do whatever else is necessary in GIMP — at which point it may be very light work, like a small curves adjustment, or, as in this case, heavy lifting involving multiple layers and masks and various filters. In this case, in Capture NX-D, I increased the exposure and saturation; tamped down the highlights; and brightened the shadows, with some noise reduction added in at the end. (The result is the middle photo below this paragraph.) These adjustments got me close to my desired result, but the shadows were still a little heavier than I’d like on the right side. These dragon eyes still needed some finer work, but it was a good reminder of the benefits of shooting in a RAW file format where fairly big adjustments only produced minimal image quality degradation. The dragonfly photo after coming out of Capture NX-D. The best way to make selective edits while maintaining image quality in GIMP is to use layers and masks. For this image, I went through multiple steps, as my little screenshot (below) gives you an idea of, though not the complete picture. I didn’t document all my steps, but offhand, I can say I used tools such as Curves, Hue and Saturation, Heal, Clone, Dodge/Burn, and (lastly) Crop; as well as filters like Gaussian Blur and Wavelet Denoise. I might have used other tools or filters, but the tedious nature of making tiny, precise edits was the really time-consuming part of this process. 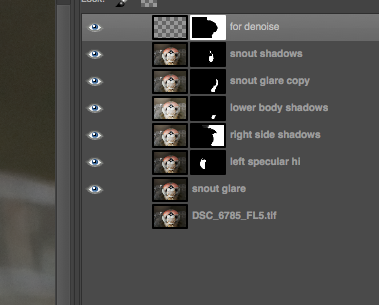 Making detailed selections in particular can take a lot of time, but it is important for creating the masks (the black and white rectangles in the screenshot). Screenshot of the layers dialog in GIMP. As you can see multiple steps were taken to enhance the photo. Looking at the post-NX-D image and the final, post-GIMP image, the differences seem more subtle to me now but still important for getting a satisfactory result. One of things I had to keep in mind throughout the editing process was the introduction of noise, especially because certain adjustments would produce noise unevenly across the image. Another consideration I held to, was to avoid small areas of shadows that might stick out and appear to give the photo unrealistic (or even impossible) lighting; I kept the right side shaded somewhat so to maintain a more “natural” look. In the end, I hemmed and hawed on little color variations and the smoothness of transitions. They are the kind of things I could spin like a top around forever on, and even writing this post, it seems like the black background and the harsh directional lighting of the original are ripe for a mysterious, moody treatment, the high contrast kind of treatment that people like to take of other people — but there’s probably a hundred ways to render it, if there’s this one I’ve actually done. Once I stepped back from the mouse, it was evident I did what I could; I felt good about the result and other photos awaited. The natural beauty of the dragonfly would have to do the rest. Posted in DragonfliesTagged black and white, compound eye, digital photo editing, dragonfly, gimp, Macro Photography, macrophotography, monochrome, post-processing, shados, specular highlightsBookmark the permalink. Nice post production work and explanation of your process for this image. Your final image is definitely a keeper but I think there might be something to say for a version half way between SOOC and the finished NX-D. For some reason my processing lately has been toward the darker more underexposed look so I am probably biased in this and like you said, “… there is probably a hundred ways to render this”. It’s that thought that sometimes gets me frustrated in pp: a hundred ways, but which is best. Waay too much info for my little brain, Michael. Great photo though. How did you get the dragonfly to hold still long enough for you to get it in focus? Thanks, Pat. For getting close to dragonflies, it’s kind of a crapshoot. Some just take off if you move an inch; others will buzz and make a big circle before landing in the same exact spot; and others still will get into a face off like this one. I don’t really know enough about them, but it seems like some species are more likely to hold their spot than others.